India women’s cricket team starts their Sri Lanka tour with a dominating ODI victory on Tuesday. 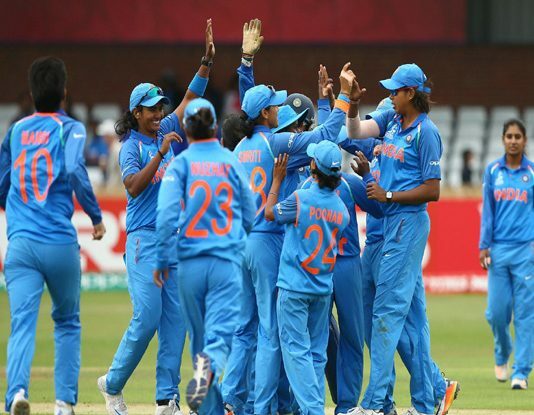 After bundling out their host opponent Sri Lanka women’s for just 98 runs, India women successfully chased down the tiny target in 19.5 overs after losing the only wicket. The hosts’ skipper Chamari Atapattu decided to bat first after winning the toss. But only the opener Atapattu (33), Dilani Manodara (12) and Sripali Weerakkody (26) reached the double-digit figures as their batting totally struggled in the game and the hosts were bundled out for just 98 runs in 35.1 overs. Among the Indian women bowlers, pacer Mansi Joshi bagged three wickets while another experienced pacer Jhulan Goswami (2/13) and the leg-spinner Poonam Yadav (2/13) picked up two wickets each. Also, Deepti Sharma (1/16), Rajeshwari Gayakwad (1/18) and the debutant Dayalan Hemalatha (1/19) got one wicket each while another debutant wicketkeeper Taniya Bhatia contributed with two catches behind the stumps. Chasing down the target, openers Punam Raut and Smriti Mandhana almost finished the game before Raut was dismissed 24 runs after 96-run opening partnership. Skipper Mithali Raj remained not out without opening her account while Mandhana continued her great form with the bat by finishing not out on 73 runs off 76 balls (11 fours and 2 sixes). With this victory in the first women’s ODI, the visiting team Indian women’s have taken the 0-1 lead in the three-match women’s ODI series. It was the 118th match for Mithali Raj as an Indian women’s ODI captain. She becomes the new record holder to lead the most number of ODI matches for a women’s cricket team. The previous record holder was Charlotte Edward who had led the England women’s cricket team in 117 ODIs. Sri Lanka women were bundled out for just 98 runs. It was their sixth-lowest completed women’s ODI total against India women on the Sri Lankan soil. India women’s cricket team have won this game by 9 wickets with 181 balls remaining. It is their second largest ODI victory (by balls remaining) against Sri Lanka women as their record was winning by 196 balls remaining at Kandy on April 25, 2004.